DEPARTED THE SHOW FEELING: I have no idea what she said, but I’m in love. Full disclosure – I don’t speak Spanish. But voice and performance transcends the boundaries of language. A friend of mine (a native Spanish speaker) called me the next day and said “I’m so lucky to have been able to understand and listen to her poetry.” Although I am a bit jealous when it comes to missing the beauty of her lyrics, the depth and validity of her work was not lost in translation. The performance of reclusive Spanish superstar Concha Buika was nothing short of brilliant. 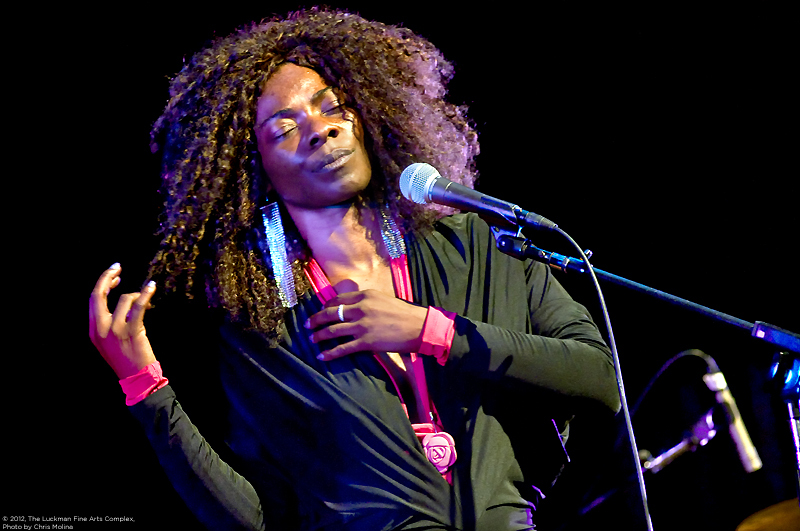 Hailed as the “flamenco queen” by the New York Post, Latin Grammy-nominated Buika made her highly anticipated return to Los Angeles after a brief retirement from the spotlight. After just beginning to make a name for herself in the states, Buika canceled a string of dates in 2011, including performances at the famed Hollywood Bowl. The Spanish songstress is the daughter of political refugees from Equatorial Guinea and grew up in a Gypsy neighborhood on the Spanish island of Mallorca. Working briefly as a Tina Turner impersonator in Las Vegas Buika began her journey as Latin’s music’s most translucent singer. Point blank, Buika’s performance at the Luckman Theatre was mind-blowing and captivating. The entire sold-out house was hanging on every note, phrase, and word she revealed. Expect this petite powerhouse to be packing in the crowds for decades to come. A legend in the making.